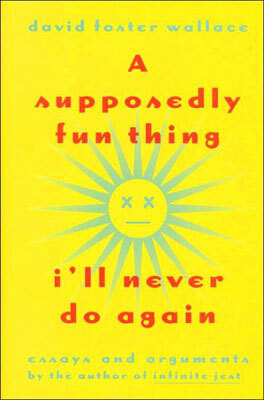 YEREVAN, Armenia – This month’s book recommendation, A Supposedly Fun Thing I’ll Never Do Again by David Foster Wallace, comes to us from Customer Services/Office Coordinator Laura Santos-Bishop. This book is a collection of nonfiction writing by David Foster Wallace published in 1997. David Foster Wallace was a contemporary American essayist, novelist, and short story writer, recognized for his unique style, which includes extensive usage of footnotes and irony. He has been hailed as “one of the most influential and innovative writers of the last 20 years” by Times book editor David Ulin. A Supposedly Fun Thing I’ll Never Do Again contains three of Wallace’s most recognized essays: the title essay which describes the ridiculous extravagance of a one week luxury cruise; “E Unibus Pluram: Television and U.S. Fiction,” on the use of irony in American culture and television’s impact on literature; and “Getting Away from Already Being Pretty Much Away from It All” detailing Wallace’s experiences at the Illinois State Fair, and exploring the excesses and peculiarities of Americana culture.